– Driver: Extroverted, egotistical, project driven, and makes decisions based on results. An example of this “Thinker” would be Donald Trump, and the “You’re fired” line. – Analytical: Introverted, project driven, and makes decisions based on facts. An example of this “Thinker” would be Dr. Spock from Star Trek. – Expressive: Spontaneous, good negotiator,and learns by doing. An example of this “Feeler” would be Jimmy Buffett who lives life to the fullest and is not detail driven. –Amiable: Peacemaker, introverted, loyal, and decides based on emotions. An example of this “Feeler” would be Dorothy from The Wizard of Oz. Throughout the book, the author describes what each personality can bring to customers, fellow employees and the sales staff; how they react as managers and what an owner can do to enhance everyone’s best talents. The book starts out like a regular retail sales training book, but highlights some great ideas. It is divided into eight chapters beginning with the financial and physical aspects of retail stores, and honesty in on employee hiring, training, building, and coaching. The author also emphasized the importance of marketing to help create a successful business and touches upon social media including Facebook, Twitter, blogging, and of course, the company website. In the beginning of the book, the author suggests a company start with evaluating their financial situation based on the Profit and Loss statements, which may require a company to increase prices, limit discounts, cut waste, eliminate overtime, and hand out paychecks personally in order to have a personal knowledge of one’s own company’s expenses. Interviews for new employees should be no longer than 20 minutes and some sample interview questions such as asking a candidate to describe a typical day at his/her last job, or describe when you went out of your way for a client can help to increase the 51% chance of choosing an outstanding employee. The importance of helping employees by using written job descriptions, handbooks for the “don’ts” of the business, and training that covers the “do” procedures will ensure employees function as you want. Great employees do the right things when you aren’t there. Mr. Phibbs used an example of an older woman coming into a store looking for carpeting. Jane’s pet had recently died and the carpeting needed replacement. The woman was retired, on a fixed income and now had a new puppy. The saleswoman found a selection Jane loved and worked up an estimate. The price was $4,200, a higher price than the woman had expected, but the salesperson offered her interest free financing for 36 months. Less expensive products were offered, but Jane kept coming back to her original choice, and just wanted to think about it. The advice and step by step descriptions of the six stages of training emphasizes there are no shortcuts to becoming top sales personnel, and exemplary customer service is always an integral part of the success. When the entire staff is able to work together, the business grows and the company makes more money. The author states there is no such thing as a level playing field in retail since stores like Wal-Mart will always be able to offer lower prices, Best Buy will always have more inventory, and a mall will be able to offer better parking than a downtown shopping district, but you can find unique ways to make your store more attractive and train your staff to consistently deliver exceptional results every day. Bottomline: I enjoyed reading the book. It is chock full of logical, practical advice. The real world examples show just how training and an awareness of different personality types can make a profound difference between success and failure. In a very tough economic crisis, businesses need to be unique and figure out what truly differentiates their business from a multitude of other retailers out there selling similar products. Phibbs shows the reader a practical step by step approach. Pros: The book gives the reader a lot of detail into the “do’s and don’ts” of building a unique retail store. There are step by step examples to jolt you into a challenging way of thinking about store design, products and staff, and most suggestions are applicable to any business. Cons: Even though I found the descriptions of the different types of personalities interesting, it became very drawn out and confusing. Parts of the book seemed to be more of a psychological dialogue aimed toward personality quirks than a guide to building a better business. Interested? 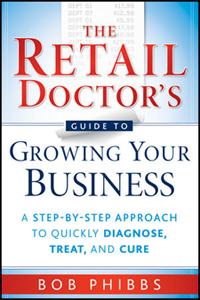 The Retail Doctor’s Guide to Growing Your Business is available on Amazon.com for $13.57 (paperback) and $9.99 (Kindle).